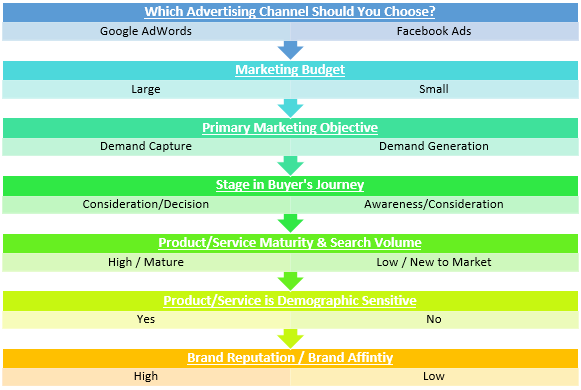 When it comes to paid advertising on the web, what should you use? Google AdWords, Bing, Facebook, LinkedIn or Twitter ads? Unfortunately, it’s not as easy as you might think and there truly is no “one size fits all” when it comes to paid ads on the web. What is the purpose of your advertising? The first thing you need to do is consider your goals and objectives. A well planned, web advertising campaign will increase your chances of success rather than ads quickly created at random. 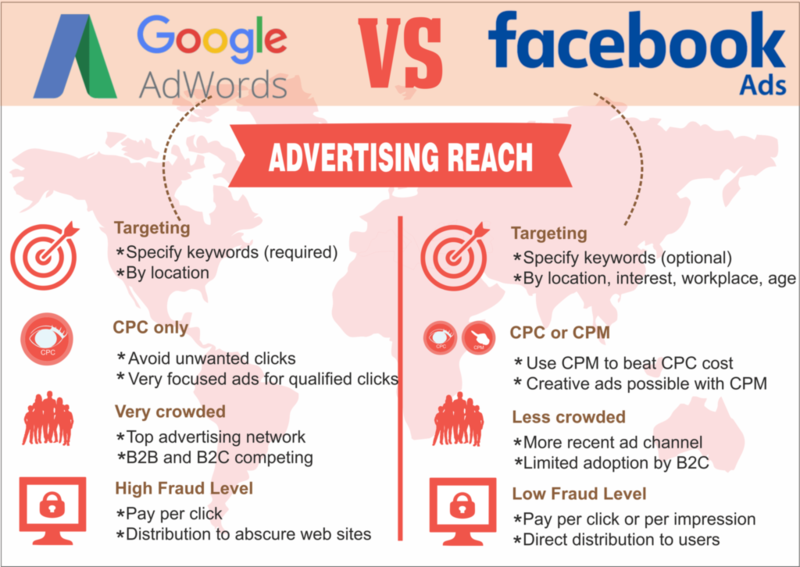 For instance, here is how Google AdWords differ from Facebook ads…. When you start a Google AdWords campaign, your goal should be targeting people who know what they are looking for and actively search Google for those keywords. If someone needs a “plumber in Albany, New York“, you need to make sure your ad is directly targeted to that person’s search. Google AdWords (and Bing) are directed at those who have a need and are searching right now. With Facebook ads you target people’s interests. With Google AdWords, you target what people are actively searching for. The cons of Google and Bing ads are that some search terms can be highly competitive and you will be bidding against others to reach that coveted position at the top of a search. The price per click can be high and $5 to $10 per click are not unusual. You’re taking a chance that perhaps your competitors are clicking on your ads, maybe the person searching is just “kicking tires” or on the bright side, maybe they are in a hurry and ready to engage with whatever it is that your ad is promoting. Even though the cost of Facebook ads continue to increase, they are still much more affordable than Google AdWords. However, the disadvantage is that Facebook ads are like ads in a magazine or on a billboard. They are clearly visible on the timeline and in the newsfeed but the chances of engagement are lower. The difference between Google AdWords and Facebook Ads, all comes down to this: AdWords can help you find new customers. Facebook helps new customers locate you. Facebook comes out ahead as far as customer reach with about 90% or more of all Internet users reached. Google reaches about 50% of all Internet users. However, Facebook users have become somewhat “ad blind” over the past few years. Even though the ads may get more exposure overall, they may be of little to no interest to many viewers. Targeting is the key. Facebook allows you to target Facebook users via demographics and interests. Due to recent legislation, some of these tools have been scaled back, due to privacy concerns. How much can you afford to pay for ads? This is the BIG question. If you’re a law firm wishing to convert ads into clients with the search query “disability lawyers”, you may find the cost for Google AdWords at around $10 per click, or more. The reason being that these are very competitive queries. Also, despite the high value of these searches (and the large potential profit from landing a client based on the query), there may be only a dozen or so searches for these terms, depending upon the geographical area, per day or per month. If you can afford $10 per click and are willing to take a chance on a high value conversion, then it’s probably worth trying. However, if you’re on a budget, a start-up business, etc. Facebook ads may be more suitable to start with. You can set a small campaign budget and always increase ad spend at a later date. If you do well with a Facebook campaign, nothing says that you can’t dip your toe into the Google AdWords waters as well. According to Hubspot, click-through rate is really important. More than a few of our higher performing advertisers had big, healthy LinkedIn pages with lots of engagement. They would often test a post or offer organically on their page first and only sponsor it (turn it into an ad) if it performed well with their organic audience. This helps them ensure they’ll get the most out of their budget. If users aren’t clicking on your ads, LinkedIn will penalize them and you’ll end up with less conversions and a much higher cost-per-lead. Very nice guidelines. I think that this text will help to explain to some new clients why some advertisements are not good solution for them in certain moment.